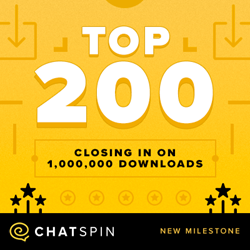 Chatspin, the fastest growing random video chat app, is becoming more popular every day as it enters the top 200 social media apps on the Google Play Store. The app works seamlessly with the web browser version of the random chat platform, allowing a user on the Chatspin app in the United States to instantly connect with a user in Germany on the web browser version of Chatspin. The number of users online at any given time has almost doubled across the Chatspin platforms over the past 12 months since the launch of the Chatspin app which has added tens of thousands of users to the platform every day. The app has received numerous positive reviews since launching with almost 7,000 users rating the app with an average rating of 4.3 stars. Users of the app can enjoy all of the features present on the web browser version of the platform including gender and location filters. One difference between the Android app and the desktop version of the platform is the method of establishing new connections. While the desktop version uses a large “Next” button to connect with a new partner, the app has implemented a familiar swipe function to quickly establish a new chat. “We are delighted to see the rise and success of the Android Chatspin app”, said Chatspin press manager, Shay Robin, “Entering the top 200 social media apps on Google Play is just the beginning as we look to continue making Chatspin a success across all platforms and devices”. The Chatspin app is completely free to download and designed to take up minimal storage on mobile and tablet devices. It is currently available in both English and Spanish with support for other languages coming soon. Regular updates are patched into the app to ensure smooth and stable connectivity with occasional major updates to add new functions and features. The success of the Android Chatspin app has led to the development of an app for use on Apple and Windows devices as well as an extension in Google Chrome. Chatspin is a random video chat app which allows people to stream live using their webcam across computers, mobile devices, and tablets. The platform allows users to connect with strangers from around the world using only a webcam and an internet connection. Chatspin facilitates thousands of random connections every day, bringing together millions of people since launching in 2015.